Nicholas LeVack has found success selling his short stories on the Kindle Direct Publishing platform. On the verge now of releasing his first book, Nicholas discusses how he used social networks – both online and in real life – to broaden his market and move sales. 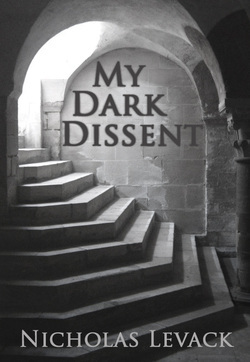 My currently released titles are My Self-Loathing Jailer, Downpour and My Dark Dissent, all of which are short stories that heavily use metaphors or conceits. My Self-Loathing Jailer and My Dark Dissent are symbolic of personal struggles I dealt with in my youth and, in some capacity, still fight today. They’re about how crippling insecurities can be in regards to their ability to isolate you from the rest of the world, even if just socially. I don’t want to sound arrogant, but I think they’re good messages for those who suffer with depression or have experienced bullying, only they’re presented in a way an average reader might find a little less accessible, given the cryptic nature of the symbols and messages. Downpour, though not a tragedy I’ve experienced personally, deals with an often dreaded situation and a state of mind – the absence of control in one’s life – I believe most of us have experienced at least once. I honestly hadn’t expected my short stories to be a viable contender on the market at all. However, I’ve at least made enough for my efforts to be justified. And compared to some of the authors I’ve spoken to who’ve been e-publishing for longer than I have, I’d say I am doing pretty well for myself. I believe the most important thing I can do to improve my sales is just keep writing, because readers will be more willing to spend their hard-earned cash on someone who looks established due to a lasting presence on the market. Fortunately, writing is what I do – I’m not just publishing my work to make a quick buck, it’s because writing is the only thing I’ve ever been able to consider as a career. Even if I’ll never make ends meet with writing alone, I’ll strive for it as long as I am able, and I’ll keep putting out stories for people to either pass up or – and I’ll always be eternally grateful for this – actually purchase. 3. Have you been published by a traditional publisher? Why or why not? Not in fiction, no. I’ve published a few articles in my hometown’s local newspaper as part of a high school internship program, but beyond that I haven’t had anything released in print professionally. I did win a contest for the original version of My Self-Loathing Jailer in 2008, but it seems that the anthology it was meant to be included in never reached print due to the organization being short on funds. I would certainly like to hold a physical copy of my books someday, though. It’s a promising endeavor. I’ve tried other freelance writing outlets in my youth, but nothing ever seemed to click. Self-publishing through Kindle Direct Publishing provides enough feedback to where I feel like I’m actually moving forward, rather than just treading water. Progress has been slow, I admit, but there seems nowhere to go but up, and for that reason I’m intent on sticking to this business. Social networking has been a big help. Of course my earliest sales came from my friends and family on Facebook, in addition to those of various online communities I’ve participated in throughout my youth. Creating my own website seemed to have a direct correlation with a temporary boost in sales, as not long after publishing the page I saw a momentary spike in the number of units sold. I’ve also submitted my stories to review, applied for various ad campaigns and other marketing programs, but I believe none of this will mean as much until I’ve published enough to have a significant online presence, as I discussed in the second question. More recently, I’ve also gotten in touch with my old high school newspaper and the aforementioned local newspaper I used to write for and it looks like they’ll both be running some sort of story regarding my books. Then just recently I got in touch with my adviser at school and it looks like this news might also be distributed throughout the English department of my college, such as through our monthly newsletters. It’s too soon to know how much this will benefit me, but I’m at least glad I attempted it. I haven’t fully opted out of any techniques yet, but I’ve begun to question the amount of advertising I’ve done on Facebook. The more I do it, the more I begin to feel like a spammer, which is especially terrible to do to your friends and family. Considering this, I’ve begun to slow the number of status updates I make daily regarding my publications and I’ve tried to adopt a more casual tone in those posts. I think one of the worst way to sell books to your acquaintances is to sound like a generic advertiser, rather than a friend. That success is possible. For a while I shied away from self-publishing because I thought it was nothing more than a scam, but now after reading the success stories and communicating with other authors who have surpassed their own expectations, I realize that it’s possible for me too. Like I’ve said before, the most important thing is staying consistent with my work, and not getting frustrated when things don’t pan out immediately. Good things take time. The main thing I want is to have printed counterparts to my online publications, but that can come somewhere down the line. Look to your family and friends and any group that you have affiliation with that might be interested in your work. I was at first timid to approach the English department of my college or my old high school journalism teacher, believing they’d view my self-publishing efforts with the same stigma some critics do, but they were eager to share news of my work. Perhaps that’s one of the most important lessons to take away from this business: don’t be afraid to put yourself out there. In truth, a lot of people are baffled by the idea of composing an entire book and are impressed by those who can. There’s probably more value in your work than you realize. Right now I’m writing The Asylum, Patient 001: Shadowfiend, the first book in a serial publication featuring the most sinister and mentally disturbed vagabonds and scoundrels you’ll find in fiction. These stories are told with a darkly magical twist that gives it an almost Twilight Zone-esque atmosphere to it, where these characters are subject to a much higher power than those causing their immediate tragedies, that there’s something almost intangible that guides their stories through a dark current. Shadowfiend releases on January 1, 2012 and I intend to release a new book in the series on the first of every month. I’m also rewriting another of my favorite short stories, The Reality of a Kingdom, that I will publish sometime around mid-January. Morose psychological literature and horror that encapsulates my personal tragedies and the darkest tales I’ve woven from my somber imagination. Readers can find excerpts, sales and information on upcoming titles all at my website. I also have a Contact the Author page and a blog for those readers who would like to interact on a personal level.